Thank you all for an inspiring Annual Meeting! Among the fifty-five attendees on Saturday, October 31st we welcomed several Christian Science Practitioners and Nurses from across northern Ohio and as far south as Lima and Columbus, including Glenmont Christian Science Nursing Facility's Director of Christian Science Nursing, Helvi Paasinen. This year's theme, "Make Channels for the Streams of Love...,"* a call to be ready to accept Love's bounty, was met with warm hearts and eager ears. President Jon Ferrell presented the Board Report entitled "Make Channels: For the Streams of Love," taken from the first line of Hymn 182 of the Christian Science Hymnal, and he discussed the myriad ways each attendee might engage himself or herself in the Missions of Overlook House and Upward Wing. Mr. Ferrell showed us how the particular gifts we cherish, and for which we are grateful, can be shared in gratitude through our unique and individual expressions of support. Visit our Annual Meeting page to view this PowerPoint presentation. Anita Lange, Upward Wing Christian Science Nurse and Volunteer & Training Coordinator, expressed her gratitude for the conscientiousness and generosity of the Upward Wing Volunteers. She discussed one of the "channels" Upward Wing is providing by its having offered this year two Home Helper Classes enabling the Love expressed by graduates of these classes to answer the need whether found in their own homes or in their church community. Kimberly Thorndike, Upward Wing Director of Christian Science Nursing, shared the past year's service activity, bringing to our thought Mrs. Eddy's directive to the Christian Science Nurse and Upward Wing's readiness to follow this Manual Bylaw and to serve. Former Overlook House President, Beth Eggers, CS, conveyed in her keynote address her "heartfelt gratitude for Upward Wing, which provides our Christian Science community the opportunity to experience the tireless expression of Christly love and comfort that the Christian Science nurse brings to 'the broken-hearted'" ("The People Wanted a King," p. 1). You can read Ms. Eggers address describing how through Love we are made "kings and priests unto God" -- as the Bible declares -- right here on our Annual Meeting page. Following the meeting, the Overlook House Board Members, Upward Wing Christian Sciences Nurses, and attendees enjoyed a luncheon together. Visit our Media Library to read our newsletter! ...A time to celebrate those who dedicate their time to be stewards and nurturers through volunteerism. Upward Wing recognizes its volunteers as a supportive link to its Field as well as the activities they engage in as expressions of gratitude from its Field. 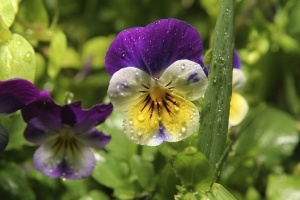 National Volunteer Appreciation Month also encompasses National Volunteer Week, April 12 - 18, 2015. President Richard Nixon established National Volunteer Week with an executive order in 1974, and every sitting U.S. president since Nixon has issued a proclamation during National Volunteer Week, urging Americans to give their time to community outreach organizations. While originally sponsored by The Points of Light Institute, the week has grown to include hundreds of organizations, and thousands of volunteer projects. This year marks its 40th anniversary! The Overlook House Board would like to express its gratitude for the loving service provided by the Upward Wing Volunteers! Find us in The Christian Science Journal! Upward Wing received in January 2015 a full three-year accreditation from The Commission for the Accreditation of Christian Science Nursing Organizations/Facilities, Inc.
As an accredited organization, Upward Wing Visiting Christian Science Nursing will be listed in The Christian Science Journal beginning this April. Overlook House President, Jon Ferrell, joins with his fellow board members to warmly thank Christe McGraw of First Church, Rocky River for graciously completing two terms of board service. Ms. McGraw brought her expertise in finance and business administration to Overlook House during its financial restructuring and organizing of the Upward Wing Visiting Christian Science Nursing service. The Board of Trustees warmly welcomes Barbara Warsinskey of First Church, Rocky River to a three-year term of service on the Overlook House Board. Ms. Warsinskey's skill and experience in teaching is propitious as the Overlook House Board moves forward this year in growing both the Upward Wing service and field participation through expanding Upward Wing's education and field training programs. Thank you Christe and Welcome Barb! Thank you all for a successful meeting! 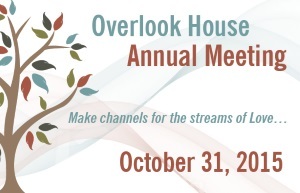 The 2014 Overlook House Annual Meeting held at LockKeepers Restaurant in Valley View, OH, on November 8th, during this national month of thanksgiving, brought together an enthusiastic group of supporters representing 10 Northern Ohio churches. The Board Report's theme of history as inspiration for the present and future of Overlook House and the Upward Wing Visiting Christian Science Nursing Service was presented through a question and answer format engaging with the audience. We learned about Christian Science nursing through the keynote speaker's historical talk focusing on Christian Science nursing's spiritual foundations. Board President, Jon Ferrell, remarked that the venue's warm and lovely atmosphere and luncheon were an expression of Soul. Reminding us of those chilly, but faith-filled days in November 1947 when The Northern Ohio Trustees gathered to incorporate Overlook House. You can help support the mission of Upward Wing by volunteering with our service. Send us an e-mail from our Contact Us page or call our business office at (216) 795-3550 to find out more about becoming a Volunteer! At its first-quarter board meeting on February 2, 2014 the Overlook House Board of Trustees welcomed Arleen Gardner of First Church, Cuyahoga Falls as the fifth member of its five-member Board. Thank you Arleen for generously accepting our appointment to serve on the Overlook House Board, and we look forward to working with you in continuing to fulfill the missions of Overlook House and Upward Wing! Thank you to All who attended the first Overlook House Annual Meeting in conjunction with Upward Wing! Keynote speaker, Catherine Shiel, CS of Port Charlotte, Florida presented to an inspiring group of more than sixty members of our Field on Saturday, November 9th, at LockKeepers Restaurant in Valley View's lovely and centrally-located historic district. Support for this event extended to Upward Wing's service borders with guests attending from as far east as Erie, PA and as far south as Columbus. The Overlook House Board of Trustees and the Upward Wing Christian Science Nurses shared reports of gratitude for the year's bounty and for the Field's dedication. Please visit our website's Media Library to view the Overlook House Board's PowerPoint presentation to the Field and return there later this month to read a transcript of Catherine's enlightening talk entitled "God, the Christian Science Nurse, and You." You can help support the mission of Upward Wing by volunteering with our service. Send us an e-mail from our website's Contact Us page or call our business office at (216) 795-3550 to find out more about becoming a Volunteer! The Overlook House/Upward Wing 2012 Annual Report was mailed to the field in July. In this letter we share how Upward Wing did in 2012, our goals for 2013, how you can help, an invitation to our Annual Meeting 2013, and the Upward Wing CS Nursing Report with patient testimonials. Would you consider serving on the Overlook House Board? Helping to meet the needs of fellow Christian Scientists, in 2012 we sent our complete set of Bound Volumes to First Church of Nairobi, Kenya. 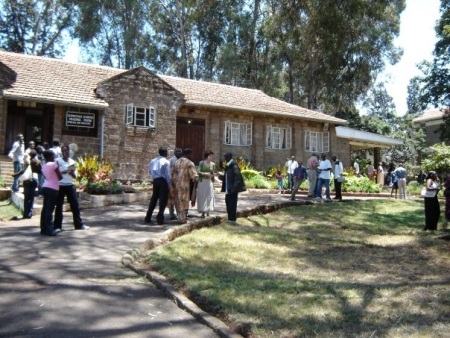 This loving church, which itself has a strong outreach program, was one of the stops for The Mother Church Board of Directors during their visit to Africa in March 2012. Clive Madifali, Clerk of First Church, Nairobi, has shared with us his fellow members' gratitude for the opportunity to place these beloved books in their well utilized Reading Room library. Upward Wing sponsored Lynne Scheiern's visit to Cleveland, Ohio to teach a four-day continuing education course to its Christian Science nurses August 14th-17th, culminating in a free community workshop Saturday, August 18th from 10AM-3PM. Lynne Scheiern, Director of Christian Science Nursing Development at Broadview in Los Angeles, California spent the week with the Upward Wing CSNs instructing them in the care for mother and infant in a home-birth environment as well as care for young children. Saturday's workshop entitled: Caring for Infants and Young Children, a Christian Science Approach, held at The Alcazar Hotel in Cleveland Heights, focused on the spiritual interpretation of conception, pregnancy, birth, and children as a guide for the expectant mother, her family, and friends through the practical stages of childbirth and care. On-site childcare, organized by the Upward Wing CSNs, was available during the workshop, and the day included a luncheon, compliments of Upward Wing. Attendees enjoyed their boxed lunches, catered by Zagara's, in the sunny courtyard of the historic Alcazar Hotel. Upward Wing provides its CSNs annual education reimbursements for their continuing education to keep them abreast of both the latest technology and methods of Christian Science care in order to help them provide their patients with the highest standard of care. Upward Wing CSNs provide training to the field with workshops like this one, and also through presentations about the Upward Wing service and how you, your church care committee, and your church membership can better support and care for family, friends, and fellow church members. We look forward to our 2013 program and seeing what unfolds for both our CSNs and for you. Let us know if your branch church would like the Upward Wing Christian Science nurses to introduce our service to its care committee and/or membership. Call 855-CSN-4YOU (855-276-4968) to schedule a date, and watch our website's calendar for our next community event. The Overlook House Board of Trustees announces its contracting Walthall, Drake & Wallace (WD&W), Certified Public Accountants, to service Overlook House, Inc. and Upward Wing, LLC. WD&W is a mid-size firm chosen for its ability to provide both one-on-one personalized service and a team well versed in the tax laws and complex reporting requirements that affect our unique not-for-profit organization. We look forward to WD&W assisting us in meeting our fiduciary responsibilities together with growing our Christian Science nursing service. The Overlook House/Upward Wing 2011 Annual Report was mailed to the field in April. In the mailing we have included a refrigerator magnet with Upward Wing's toll-free number in bold print for easy reference, and a contribution envelope with information on how to send your tax-deductible contribution in support of Upward Wing. To give us your mailing address or update your contact information please click here. To view the online version of the 2011 Annual Report visit our site's Media Library. The new Upward Wing website is live. Please check back often as we will be posting our newsletters and upcoming events on the site. You can also visit the Contact Us page to be added to our mailing list.